I?ve made muffins, pikelets, waffles and bread, and the enduring habit seems to be making mini muffins. My mother has always been a fan and has even started making her own. 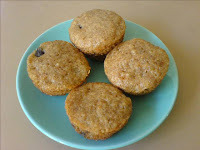 My favourite version of this recipe is Sultana Mini Muffins, but in the past sultanas have easily been replaced by coconut, carrot, banana, pumpkin, or any other item that takes your fancy and feels like it would work within a mini muffin recipe! I suspect the variations are limited only by one?s imagination? I use rye flour because I seem to have developed intolerance to wheat flour but have not yet been diagnosed as celiac. If self-raising flour is your preference, then don?t include the cream of tartar and baking soda. Sultana Mini MuffinsPreparation time: 15 minsCooking time: 15 minsMakes 24 mini muffins Ingredients:1 cup rye flour1 1/3 tsp cream of tartar with 2/3 tsp baking soda 1 tsp mixed spice3 tbsp sugar--- The above ingredients can be stored together in a container in the fridge for days or weeks before you need them. If you prefer to sift the flour, cream of tartar and baking soda then do this before adding the mixed spice and sugar. Method:Preheat oven to 180 degrees Celsius. Grease mini muffin tray(s) ? one large tray for 24 mini muffins or two smaller trays for 12 mini muffins each.